Weave Words 1.5 is puzzle & word games software developed by Redclaw Games. This is a demo version of the program. In order to use full version features, please go online and order a full version of Weave Words 1.5. The full version is available at regnow and Redclaw Games website for $19.95. Weave Words 1.5 supports English interface languages and works with Windows 98/XP/Vista. We have tested Weave Words 1.5 for spyware and adware modules. The software is absolutely safe to install. 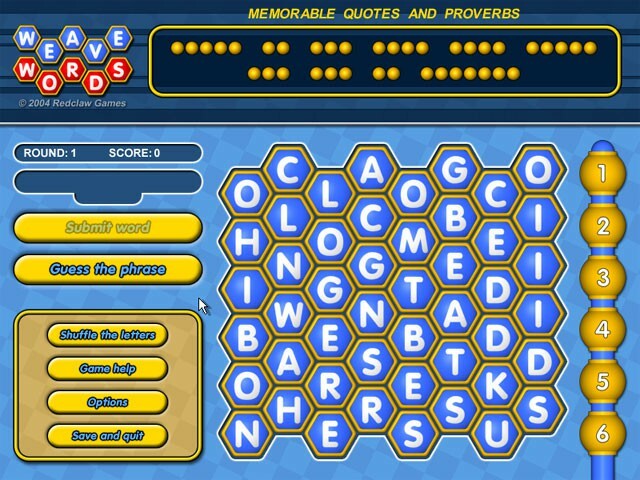 We has completely tested puzzle & word games software Weave Words 1.5 many times, written and published the interesting article and uploaded installation file (4103K) to our fast server. Downloading Weave Words 1.5 will take minute if you use fast ADSL connection. You'll flip for Flip Words! The perfect quick coffee-break diversion, Flip Words challenges you to form words from letters on a grid, and then use those letters to figure out a popular saying, title, famous person, occupation, or other phrase. Words formed from letter-tiles fall through 3D space and land stacked on the word-grid.